My vet is out for something else and I ask her to take a look at Diamond. She said the bow is no big deal but that bulge around the back of the tendon is a restriction of the annular ligament and needed a minor procedure done to open it up. Oh geez…now I have to call Allie and tell her the horse needs a minor surgery. I told her I would give him free lay up board and anything he needed and she just laughed and promised me we had funds and that it would all be alright. He went to hang out at the lay up farm and when I had stopped over in October I couldn’t help but to get on him. There has always been something about him that has drawn me to him. Despite not being ridden since the track he was perfect for me as I rode him in a huge open field pushing him to keep him going. He was a bit sore on his feet but very sound and looked fantastic. The weather has been total crap since he arrived. 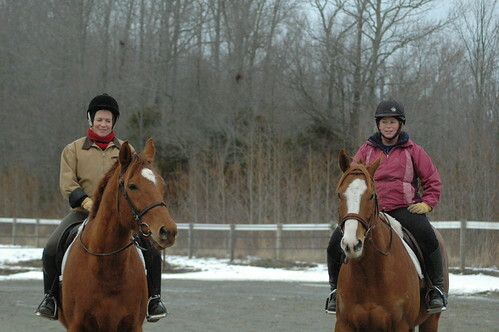 My friend Alison rode him the first time and he was perfect. He doesn’t spook at anything and he just doesn’t get rattled. 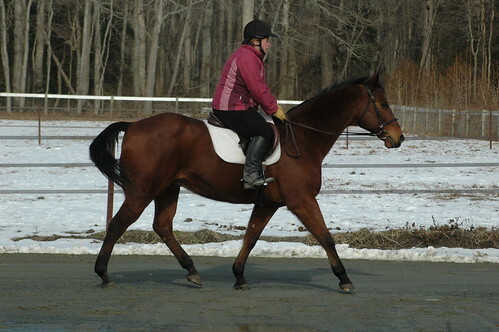 He has a nice big trot and can go on a loose rein or into contact. 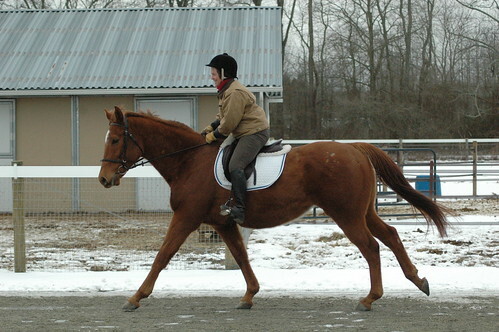 Canters along and you have to push him to keep him going. If you stop riding he just stops 🙂 He is super tolerant of out of shape winter riders! I felt so all over yesterday and he was just going along like he would carry a beginner without even getting worried. My ring is snow covered and he started out pretty ouchy. He is barefoot and the ground is doing the freeze/thaw and he is sore. I decided not to put shoes on him until after I started to get him fit but maybe I should have. He stretched out so I kept on going. When they are out of shape I just do big straight lines and go across the diagonal to change direction but keep it short and sweet. His walk and canter are like riding a big couch but he has a very nice ground covering sweeping trot and is going to be a really good mover. It’s hard to believe he isn’t fit and hasn’t been ridden but three times since coming off the track in June and he feels this good. The whole time I was riding I just had the biggest smile because this horse tries so hard and he is just fun. 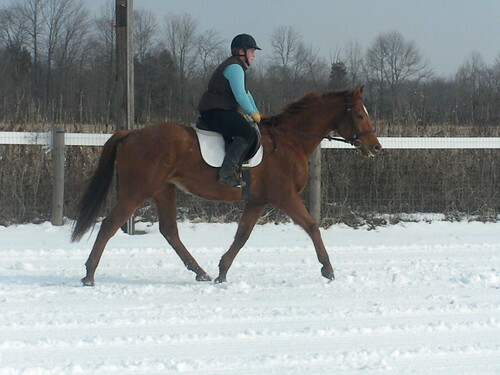 I realize those of us who do the retraining constantly talk up our horses but it is because they are just this nice. 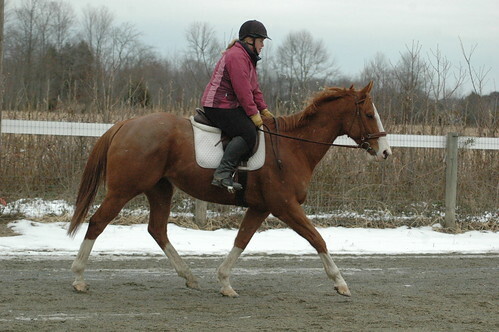 This horse is the type of horse that fits the person who doesn’t want to lunge, who might ride once a week and wants a horse who will be sane, who wants to hunt/trail ride/event/hunters and just have a fun all around horse who is fancy enough to win at the shows yet will go out and trail ride sanely the next day. He is a horse that will make you eager to come to the barn and go for a ride or just to brush him and spend time relaxing. He is just that pleasant. I had a few friends horse shopping earlier this year and I told them this was the horse they should buy. I know they didn’t think I was crazy but they asked if he had been in training and how was I just so sure he would be so quiet and good. I really can’t answer that besides saying when you do this for a living you just know. I swear sometimes you can look into a horses eyes and just know how they will be to ride. This horse spoke to me from the first time I saw him and something about him made me say it would all turn out alright. 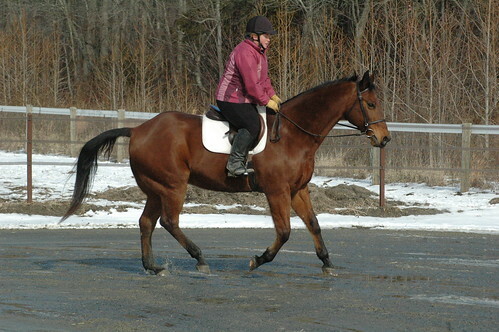 I haven’t advertised him yet but I will be putting him up on dreamhorse soon. I expect he will sell very quickly as he is just that easy and nice. Here are some pics from our ride yesterday. They aren’t all that great as we took our regular camera and all our lenses in for cleaning so this is my little point and shoot camera. My video software died last night so video to come in the next few days. I also had two fantastic trail rides on Ranger. I took him back out yesterday and he was way more relaxed. We had a nice canter and he thought that was awesome. He will be headed down to South Carolina on next weekend with a friend of mine to see if he may fit another friend of her’s. Ha, that was confusing but it should all work out. We were lucky and only got about 3″ from the last snow storm but the 2″ of rain that fell before the snow has made a real mess. 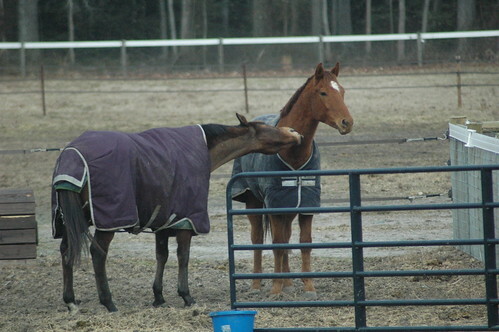 The constant freeze/thaw process is so hard on the horses. Those who are barefoot or have sensitive feet tend to pick their way across the field going ouch..ouch..ouch. I told Allie that Casey needs to come to NC as it would be much kinder to his feet as we get those angles changed gradually. He does have pads with packing but I can tell you when I walk across this lumpy frozen footing it hurts my feet! My hubby was riding my horse and I took Ranger. I don’t know when the last time that Ranger has been trail ridden is because he has primarly been a pony horse the past several years. You could tell he was trying to figure out why I put the saddle on him and then put him in the trailer and why I was bridling him in the trailer when we got there. Despite his nerves he stood perfectly and waited for the group to get mounted. He was ready to get going and for whatever reason my horse decided to do some leaps in the air so Kurt got off and checked all the tack. We are thinking maybe the girth pinched him?? He is silly anyway so he could have just been being bad. They all were ready to go with lots of energy from standing around doing nothing in their fields. Ranger was happy to lead the trail and didn’t look at anything even the stuff most horses would be scared of. He was jigging at first and walking fast when he wasn’t jigging but nothing bad just a little jig. We had a really nice long trot to settle all the horses down and we let Kurt take the lead and Ranger was happy to hang out in the back or middle. We kept laughing as Junior (my horse) was throwing snow balls out of his feet at the rest of us and sometimes spooked himself as they flew up and hit him in the belly 🙂 A few snow balls whacked ranger right in the side or on the neck and that didn’t bother him a bit. After our trot we had a nice walk and you could see that Ranger had relaxed. He now walked nicely on a loose rein and was happy to just look around and enjoy himself. You have to remember he has spent several years keeping up with very fit racehorses so he doesn’t understand why he should just mosey along. He has to be taught to just relax now and enjoy his new easier lifestyle. We didn’t canter as the rest of the group had horses who were pretty excited so that might have been a bit too interesting. We are all going out again today so it should be better. Ranger was tired when we got back as he is a bit out of shape but we were careful not to ride them to hard. I hope to get the snow cleared off my ring so I can ride some of the crew at home today but I will be taking the rest to the trails and doing trot sets. I’m trying to keep them all in work the best I can. Wow, cold enough to take your breathe away. 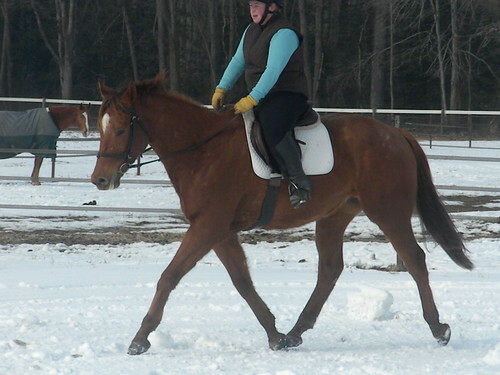 I actually did ride the horse that I am rehabbing as he needs to walk on hard footing and I think the frozen riding ring falls nicely into that category. 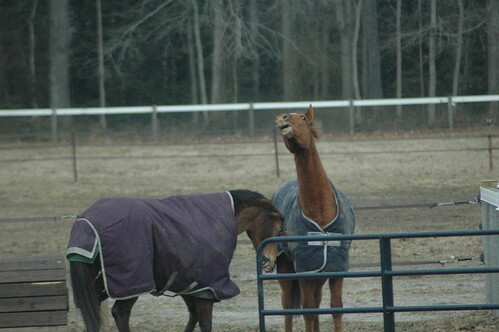 I would occasionally get up and lookout my dining room door and see what the horses were up to. I think some of these pictures will fill you in pretty well but it is just something that you have to see to believe and I found myelf calling Kurt over to watch and there we stood laughing. I would step outside and take a few pictures and then quickly go OMG it’s freezing and come back inside. 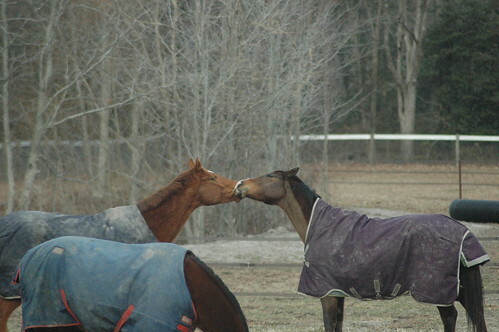 The first scene that played out was Diamond and Casey playing tug of blanket and biting each other on the hind legs. 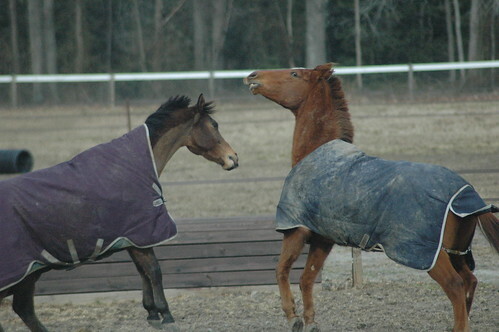 I sometimes think people wonder where I get all the money to buy these nice rambo blankets but one thing I realized early on with horses is that when you buy quality it will last and you really do need a war horse of a blanket to hold up to this sort of play! 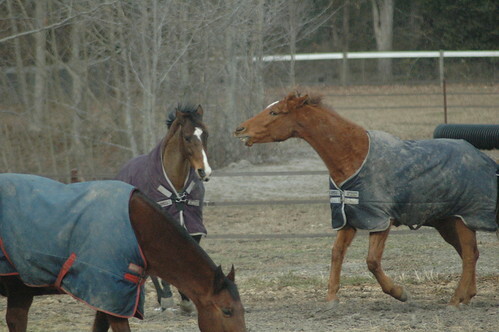 I think Diamond eventually gave Casey a swift kick and Casey went off to eat hay. On my next break, I look out and see that Shoes and Diamond have now started up the next game which is the game of face biting. Shoes and Diamond arrived together and they were best friends. They are so happy to be back together and spend most of the day rough housing with each other and then with Casey. Kills me with the cuteness. I can’t tell you how sweet he is and he just loves people. He is more like a big dog than a horse and he actually likes when I wrap my arms around him and give him a big hug. Casey and Ranger claim they are totally innocent and blame it on Shoes and Diamond. I need to get some of these guys advertised but with the ground freezing and thawing I notice they are a bit tender on their feet. Hate winter but nothing you can do about it. Looks like it is supposed to warm up starting Tuesday but with rain??? So not funny! I was totally unmotivated today with the cold dreary weather but my friend Alison (she owns Top Punch) is crazy enough to say she wanted to come and ride so I got off the computer and went outside. I am sure that Alison and I could gush on and on about Diamond but she said she would take him in a second. 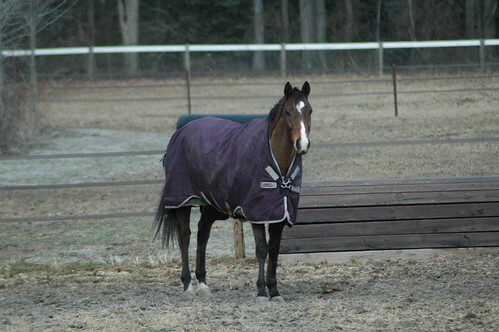 He was in a new place with 3 horses in the ring yet walked around on a loose rein like he had been there forever. Glanced at things but no more than a prick of the ear. 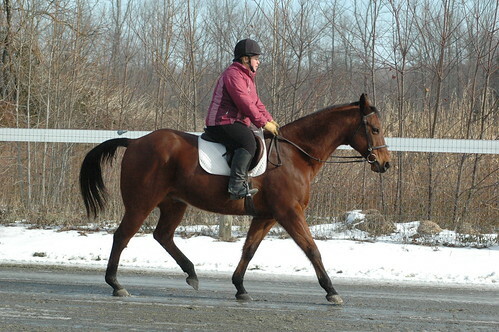 He is a really nice mover despite his lack of muscle and was as slow as I remembered him to be. Alison and I are both out of shape due to lack of riding in this crap weather. She was pushing along and noted that he was so tolerant of her shifting all around and she worked to keep her balance. If she took her leg off he stopped! Ha, gotta love that. 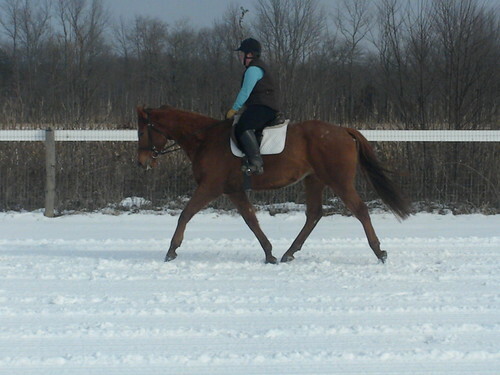 I made her try out the canter and she really had to push him to get into it. He has a nice mouth and is just so happy to do whatever being asked. This is one big horse. I forgot to stick him but we noted that not only is he really tall with huge bone but he has the biggest barrel. Probably a lot of that is from our fantastic layup farm which has the best grass you will find and is now feeding beautiful round bales. The horses are fat! Here are some pictures of big boy. Casey is such a good boy as well. Sometimes I wonder if people believe that I over inflate on how good these horses really are but you would have to see them/sit on them to even believe it. Casey is another horse with a fantastic brain and just so eager to please. 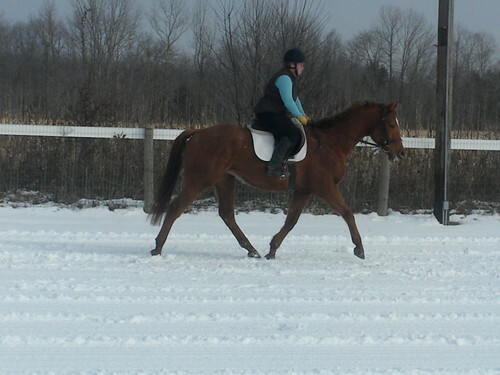 He was a bit sensitive on the very hard riding ring so I just walked and trotted around. Diamond and Casey pose for the camera. It was cold!!!!!!!! Alison was game for another set and I was happy to have company so we got out Ranger and Shoes. I wanted to stretch out Shoes after his lesson yesterday. Alison spent most of her ride laughing as she tested out all of Ranger’s buttons. It is just so cool how easy he neck reins and how well broke he is. He has this great canter and jog but he has an agenda. We were trying to come up with a way to describe him but it is hard to figure it out. He is not a slow version of a quarter horse because he prefers to go somewhere. He isn’t going there fast but walking is not his preferred speed. He stops when you ask but he is always asking what is next like he has his mission and you are stupid to not know what it is. I would say he is a horse who could be your trail horse but also be a foxhunter, do some hunter paces, ride western/english and just be that all around horse. He ground ties and just has perfect manners. Alison remarked he didn’t move a muscle while she tacked him up. Cool horse! Shoes was just super fantastic today. I’m a believer that horses just sometimes grow up and it is simple as that. I tell people that and I wonder if they perhaps think I am again making up stories but he walked out there today and didn’t even notice the barrels on the side of the ring. He went to work and was stretchy and felt so loose and soft everywhere. I just walked and trotted as the footing wasn’t good enough to see what the canter felt like today but I swear every ride this horse just improves that quickly. I almost feel like he now knows what is expected of him and is going above and beyond to meet the new demands because he understands what I am asking. I love his personality! He makes me smile everyday and I appreciate how hard he tries. I love working with all these horses and all the different versions of a Tb. We got a lot of riding done this week which is good because the weather this week isn’t looking so good. I have been trying to stay positive despite this weather that is not allowing much riding. I booked a lesson on my own horse on Friday at 6:30pm and the temperature was 19 degrees 🙂 It has felt very strange to only have one personal horse however it is going to stay that way as I’m on a debt paying mission. 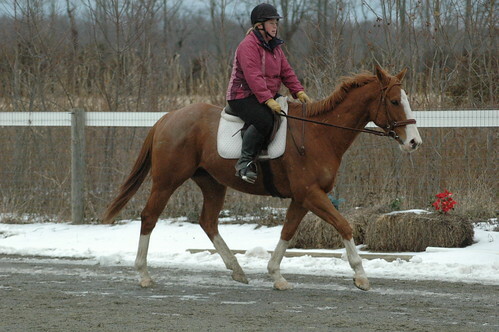 Junior, my conn/tb, is one of the most sensitive horses that I have ever sat on. He is freaky smart and athletic which is why I have kept him around for 7 yrs now (bought him as a 3yr) but lord is he quirky. He walked into the into and Mogie thought he was a stallion. He was on his tip toes prancing and dancing and squealing just standing there. He is a horse who loves a job and is eager to do it. His ground manners are absolutely horrible despite me trying to improve them for all these but he is great to ride so I live with him. It was a fantastic lesson and we have been working to get our partnership back together. He was eventing and getting ready to move up to training level but injured his knee being stupid in the trailer and although he has been sound since the injury I let everyone else ride him giving him a nice long recovery because I was just too busy to ride him myself. Having him back will allow me to just focus on myself because he knows his job. That is quite a luxury for me as I am typically always on green horses. My riding skills lose polish and bad habits creep in quick if you don’t have a horse that allows you to just focus on riding well and not dealing with drama. I have really been on a fantastic high all weekend because I have had such great rides on my OWN horse. Silly but it is an amazing thing. Saturday morning, I took Acclimate over to the Centreville farm and he settled in nicely. We picked up Ranger and Diamond H. Diamond H was way out in the pasture so as we walked out we visited with Bill, Bushy and Letterman who were chowing down on a fresh round bale. I quickly realized the halter we took to catch Diamond was not quite big enough for his massive head so we basically walked him in with a rope around his neck and loaded him up. We took off his blanket and loaded him on the trailer with acclimate and then took off acclimate and put Diamond’s blanket on him and turned him out. I headed out to catch Ranger who supposedly doesn’t like to be caught. He played the game for about 2 min and then went okay and I stuck his halter on. Mort, Pegagus and Rusty are in that field and they are overly friendly. They followed me around and Kurt had to clear the gate for me. It’s nice to have horses who are such pro’s at loading. 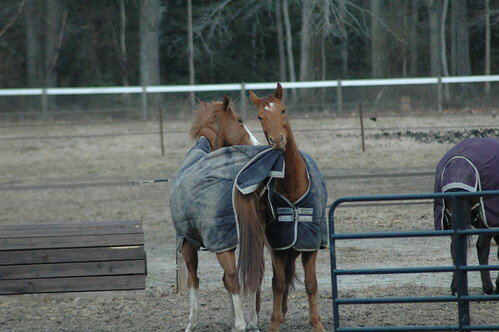 We unloaded them here and let them settle in to stalls. I started attacking the long hair on Diamond. I need to put a stick on him to see how big he is but he seems so massive to me. He is just a huge boned horse and the sweetest horse. I have him in crossties with the halter around his neck working on pulling his mane. Then I trim his ears, bridlepath, muzzle and fetlocks and he is just snoozing away. He is such a kind and smart horse. I begin to groom him and realize he has horrible rainrot up on his back and I attack that with a good curry. I decide that he needs a bath and some medicated shampoo so into the wash stall he goes and I work super fast giving him a good scrub. It’s cold out but that stuff is painful and nasty so it had to get dealt with. I have warm water so hopefully it wasn’t too bad. I bundle him up in a couple of coolers and he goes back in. Jacob J’s owner arrived right after I had gotten done with Diamond so we loaded him up and he headed back home. I had planned on getting on Ranger but time got away from me and I was tired. Sunday, I was back on the mission of cleaning up Ranger. Have you ever had a horse that is just so wise that when you look into their eyes it’s almost like they can read you? This horse is freaky smart and has these eyes that just penetrate you. He also stood perfectly with the halter around his neck as I got him all cleaned up. I had 30 min before I had to head of to a lesson with Shoes but enough time to ride him. I quickly saddled him up and off we went. Ranger is a 14 yr 15.3 h quarter horse and a big boy! 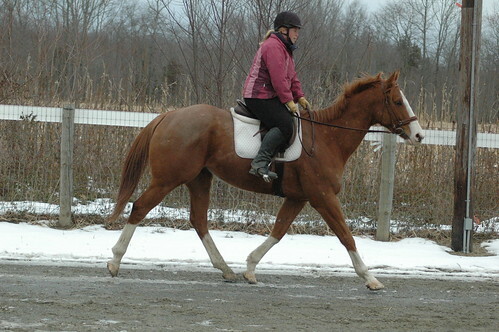 I have ridden plenty of quarter horses but this guy rides uphill and is super balanced. He doesn’t pull and is so light. He has an incredible work ethic. He wasn’t interested in walking so we jigged a bit but not in a mean way just come on lady let’s move a bit. He has a great jog, super little lope and he does trot and canter if you ask him to move out. He is broke to death! Neck reins and knows all sorts of fun stuff. I rode him out on the trail real quick and he was loving that. Quick treats and back outside he went. Isn’t he cute???? I quickly got Shoes ready as he was headed to his first off the farm trip over to the indoor for a lesson with Mogie. Not the brightest thing because the weather hasn’t allowed for much riding so I hadn’t ridden him in a week or so but hey it was as good as time as any. I put his saddle on and bridled him when we got there. He stood perfectly when we got him off the trailer and was super good. Walked calmly in the indoor and looked around but not nervous. I lunged him for less than 5 min and it was apparent he was pretty chill. What a good boy! My mom brought a young horse to ride so the beginning of our lesson was just weaving in and out of each other playing leap frog so the horses could learn how to pass and be passed. Always good to practice before you head off to a crowded warmup ring. I thought Shoes felt really good despite our lack of riding. He is a quick learner and retains everything I teach him so even when I haven’t been on him in a week he is picking it right back up. My goal has been forward and stretchy and he is now starting to reach underneath himself and push into the contact. 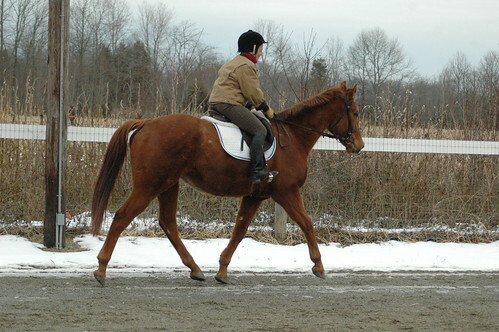 He tends to want to move up and down at all gaits so while you don’t want him rushing in the temp he has to come forward enough to have a feel of the contact. His back felt so soft and swinging. The canter is his weak point not that it is a bad canter but he just needs more muscle to sustain the canter and the damn weather is not cooperating with me riding enough to build muscle. It will come so I have to keep that in mind. We even did his first jump undersaddle!!! He was such a good boy and seemed to remember the little lunging session that I gave him. I was worried he might be OMG at the jump like he was when I started our lunge session but I’m telling you he is super smart and willing so breaking it down with the lunge session was a perfect intro. I did almost fall off….it was pretty funny now that I can say I didn’t fall off. We were walking along getting ready to start jumping when ice came falling off the indoor roof. 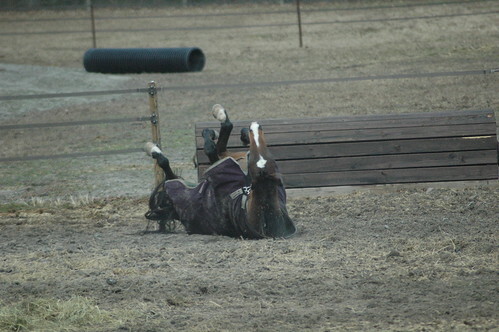 Mogie said I really looked like I was a goner as his hind end went straight out from under me but somehow I saved it. It was a miracle if you ask me because I was so far off the left side I didn’t think I was getting straight enough to ride it out. Wow, that was intense! The fact that he went on about his business after that speaks volumes for his brain so I was so thrilled. When he got home and was turned back out he went out into the pasture and was bucking and squealing. I was cracking up. He has the biggest personality and it was like he was telling his buddies how awesome he was. Funny stuff. I’m headed back out to see if I can ride a few. It’s cold and dreary here so the ring is probably frozen. My friend Alison is coming over so I will pull a few out and do something but it may not be too productive. Here is some video of Shoes at our lesson. I’m generally a pretty positive person for the most part. I think the key to my positive attitude is being able to work outside in the barn and ride the horses. When winter comes and continues to dump snow on us every week I start to lose some of my positive attitude. 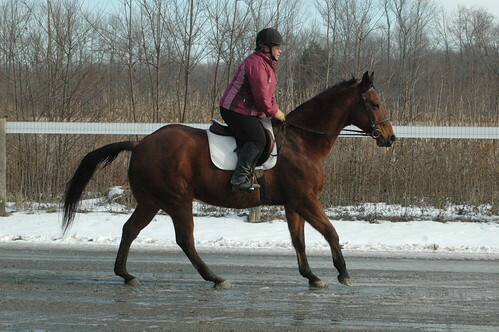 I had to laugh this morning when I got a comment from Cindy Wood saying she was living through me and I should update the blog 🙂 Ha, nothing to update here since my last little lunging session with Shoes because it continues to snow enough to make the ring unrideable. Kurt plowed the ring off yesterday after our 4″ of snow and right now it is pretty icy so we have to wait for it to warm up enough to melt the top. Currently no horses that are barefoot so I can’t ride and risk them hurt themselves going faster than a walk with snowballs in their feet. I have plans to bring back Diamond H and Ranger. 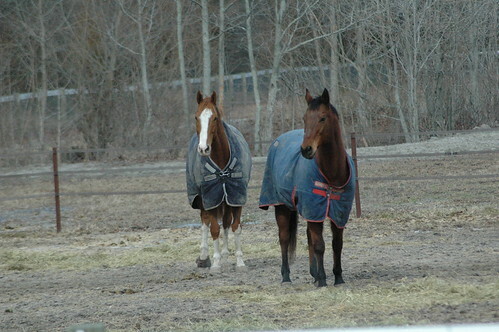 I have some buyers looking for horses like those two so I hope to get them going and help them into new homes. I have been delayed in progress with Casey due to a disappearing farrier. Gotta love farriers….really how do people stay in business when they have such poor customer service? This is my farrier of 5 yrs now and he can’t even give me a courtesy call. Oh well called another farrier and have an appointment today to get the backlog of horses shod. My job has been absolutely crazy busy and I find myself working way later than normal but at this time of year it is okay because I can’t ride anyway 🙂 We had a bunch of people in my division retire and I’m currently in charge. Being in charge is both good and bad but for the most part good. I’m always remind myself that I am fortunate to have a good job with good pay and flexible hours that allows me to fit in horse time. It looks like the weather might cooperate with us here soon so I hope to get some more updates. I should come back with some pictures and videos of Ranger and Diamond over the weekend. I’m looking forward to that. I will probably advertise Casey here soon as well. 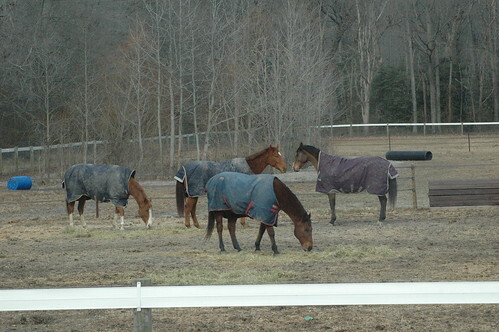 We need to get some of our current horses in homes so we can free up room on all the layup farms for the spring when the tracks start-up again. I have been behind in terms of starting Shoes over fences but the weather and footing have made riding inconsistent and his muscling is still in development. I absolutely LOVE when readers of my blog reach out and share experiences, advice or just comments. I’m in no means a perfect rider and as horseman we are always learning and open-minded. We got a fantastic email from a reader last night about recognizing some similar behavior in Shoes as her personal horse who had some SI issues. She said her mare did the similar hopping at the canter and little bucks which were not really bucks but something saying ouch. 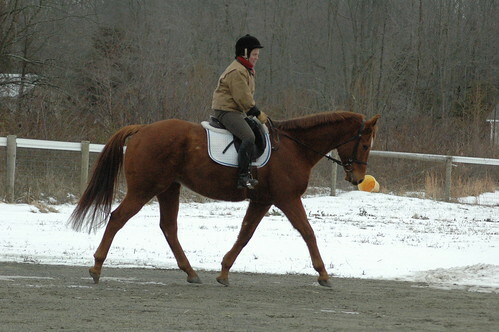 I have had a lot of experience with ottb’s and the biggest challenge that I believe they face is overall hind end funk. Ha, great explanation but just the act of going from standing still in the starting gate and taking off running is very hard on the muscles and body structure. Then you take a horse who is extremely muscle-bound in a particular way generally using the fast twitch muscles and you bring them home and give them some time off and they lose all that muscle. All of a sudden you have loose stifles, lack of strength, no topline, weak back and an overall soreness. Now some horses will never experience that and sometimes it is helpful to lightly work a horse after they come from the track to prevent the massive loss of muscle but we don’t have that opportunity for every horse. 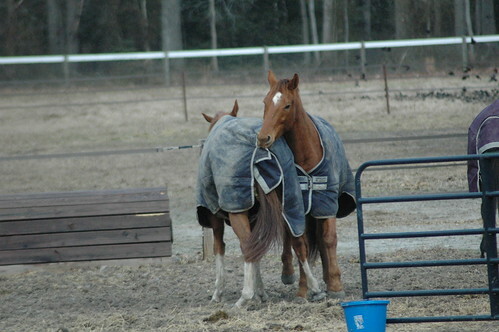 Mentally, I believe it does them wonders to have a bit of time to just hang out and be horses without any pressure to perform under saddle but again that depends. 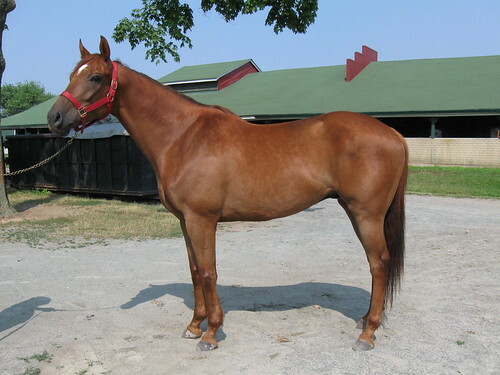 Shoes was a horse who had a drastic decline when he came off the track. He went from simply gorgeous to losing 200lbs and being so sore he didn’t even want to walk. Some horses just don’t transition well to the new lifestyle and he was one of them. We were really worried about him and even tested him for Lyme but he was fine. I kept promising the farm he would be fine and they kept saying they had to hide him behind the barn because he looked so rough 🙂 He was getting plenty of food but when your body hurts it’s hard to let everything relax enough for the calories to catch up. He finally started to look better so I wanted to bring him to the farm and at first he was what I would call a horse that is weak behind. When I rode him he felt funky behind. I really just don’t worry about that but I am very aware of the level of work that I require of them. I worked 10-20 min sessions under saddle but I did most of the work on the lunge line teaching him how to go forward and use his body in the correct way. He feels like a different horse under me now. Instead of bucking every other stride at the canter he happily canters with just a little wee around the corners when I make him step evenly in behind. He trots forward and engages from behind and his back feels relaxed instead of him moving like a pogo stick. Normally, I would introduce jumping under saddle but with him I think it will be easier for him to learn the mechanics without the rider as he develops his muscles. I love free jumping but with the footing my jump chute is on grass and not great for this freezing/thawing weather. He was so proud he wanted to just keep cantering around and jumping even when I wanted him to stop. I made a little cavaletti oxer and he thought that was way cool. He was strutting his stuff. Should have seen the trot on him! You can dress up the fence with a little brush box or something like that. Antother good way to introduce scary things without being on their back when doing it. I feel like Shoes is an exceptionally smart and athletic horse. He tries so hard to please and just has the best personality. The groundwork is going to pay off in helping him become more confident. I will try to video some of this over the weekend when I have daylight.